We're back from RMAF! Thank you very much to all of you who came to our room. During the show, we had a total of 20 seconds in which our room was not full of visitors. I know, I timed it! On display (world premiere) in our room was the NEM AI-50 amplifier in mono bridged mode. 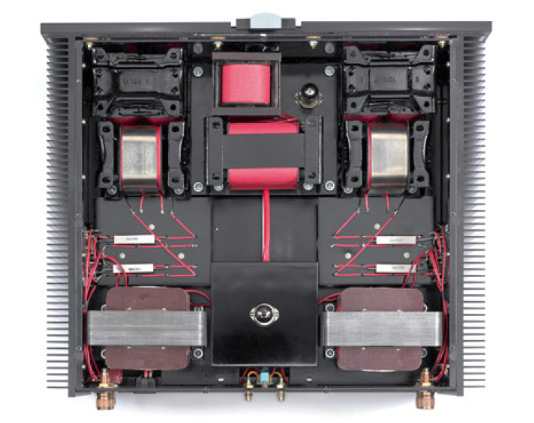 This amplifier provides the best of both tube and transistor technologies (hybrid design), powered by a unique Choke Input Power Supply, something you have not seen in the world of audio, for its high material costs. Above you see the NEM AI-50. What you see is 140 pounds of meticulously hand made and cryogenically treated transformers, each taking two days of labor to create. We are happy to announce that LessLoss shall be distributing this fine unit in the United States and shall be educating the public about this uniquely engineered world-class performer via the LessLoss website. The NEM design team is from Russia. They have studied transformer technologies and cryogenics for many decades and have expertise in this field which brings forth a truly miraculous product. In an amplifier world of "me-toos", this solution stands out in its uniqueness and in its unbelievable transparency, because there is no "amp sound" there to put your finger on. Retail price: 19,500 USD. More information to come later. One is in the Belgian Hi-Fi journal, www.puresound.be, English version to be found here. The other is in the Norwegian print magazine, Hjemmekino, the English translation of which can be found here. We have updated our new Firewall page with some pictures and possible system usage examples, as well as an article about the unit. Firewall pricing information, including pre-order details, should be available within about 10 days from now. It will be announced via these Newsletters. The pricing for the new LessLoss distortionless interconnect system, the Tunnelbridge, shall also be announced via Newsletter, at a similar time. Pictures and description of its operating principle are found here. We are very happy about these new products and look forward to serving you with these and future developments, all of which are at the very cutting edge of what high end audio can do.